Although their title bout appeared to be closely contested, UFC featherweight champ Jose Aldo (Pictured) ultimately posted another unanimous decision victory when the scorecards were read. Unlike Aldo’s last outing where he swept the first four round against Mark Hominick only to give away the final stanza, Kenny Florian wound up winning the first five minutes of their scrap on Saturday night. Unfortunately for Ken-flo, it was all down hill from there as the Brazilian took the final four rounds to win a (49-46, 49-46, 49-46) decision inside the Toyota Center in Houston, Texas. Their 145-pound affair wasn’t the most thrilling contest on the card, but it did provide some exciting moments. 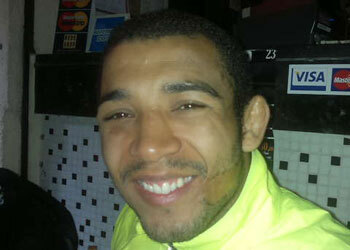 1stRound: Florian lands a leg kick, but Aldo forges ahead and tags him in the eye. Aldo stuffs a takedown and unloads a barrage of punches. Florian gets him to the mat for a brief moment, but the Brazilian gets back up. Florian has him pressed against the fence. The challenger working hard for takedowns. Florian, 10-9. 2ndRound: Aldo is reluctant to throw kicks due to Florian’s takedowns. As I type that, he lands two big ones to Florian’s lead led. Aldo nails him in the head with a kick. Florian gets him with a powerful leg kick in return. Aldo, 10-9. 3rdRound: Aldo scores on a one-two combination. Then again with a straight right. The champ pounds Florian’s lead leg and follows up with a right. Aldo starting to find his groove. Florian goes for a shot, but Aldo ends up on top. Not much action on the mat, as Florian works his way back up. Aldo, 10-9. 4thRound: The inside of Florian’s right thigh is purple. He goes for a takedown and eats Aldo’s knee while in the clinch. Florian still relentless with his takedown attempts, but he keeps getting denied. Aldo hits him with a right as the horn sounds. Aldo, 10-9. 5thRound: Florian gets denied on another single-leg takedown. Florian tries a knee and slips to the mat. Aldo moves to full mount, but Florian is active and avoiding any damage. Florian works his way back to his feet. Aldo, 10-9, and wins the bout 49-46.